In 2016, the first year health-care providers were allowed to bill for an end-of-life consultation, nearly 575,000 Medicare beneficiaries took part in the conversations, new federal data obtained by Kaiser Health News show. [T]he 90-year-old woman in the San Diego-area nursing home was quite clear, said Dr. Karl Steinberg. She didn’t want aggressive measures to prolong her life. If her heart stopped, she didn’t want CPR. But when Steinberg, a palliative-care physician, relayed those wishes to the woman’s daughter, the younger woman would have none of it. Instead of arguing, Steinberg used an increasingly popular tool to resolve the impasse last month. He brought mother and daughter together for an advance care-planning session, an end-of-life consultation that’s now being paid for by Medicare. In 2016, the first year health-care providers were allowed to bill for the service, nearly 575,000 Medicare beneficiaries took part in the conversations, new federal data obtained by Kaiser Health News shows. That’s good news to proponents of the sessions, which focus on understanding and documenting treatment preferences for people nearing the end of their lives. Patients, and often, their families, discuss with a doctor or other provider what kind of care they want if they’re unable to make decisions themselves. Nationwide, slightly more than 1 percent of more than 56 million Medicare beneficiaries who enrolled at the end of 2016 received advance-care planning talks, according to calculations by health-policy analysts at Duke University. But use varied widely among states, from 0.2 percent of Alaska Medicare recipients to 2.49 percent of those enrolled in the program in Hawaii. In part, that’s because many providers, especially primary-care doctors, aren’t aware that the Medicare reimbursement agreement, approved in 2015, has taken effect. There also may be lingering controversy over the sessions, which were famously decried as “death panels” during the 2009 debate about the Affordable Care Act. Earlier this year, the issue resurfaced in Congress, where Rep. Steve King, R-Iowa, introduced the Protecting Life Until Natural Death Act, which would halt Medicare reimbursement for advance-care planning appointments. That’s just the discussion that the San Diego nursing-home resident was able to have with her daughter, Steinberg said. 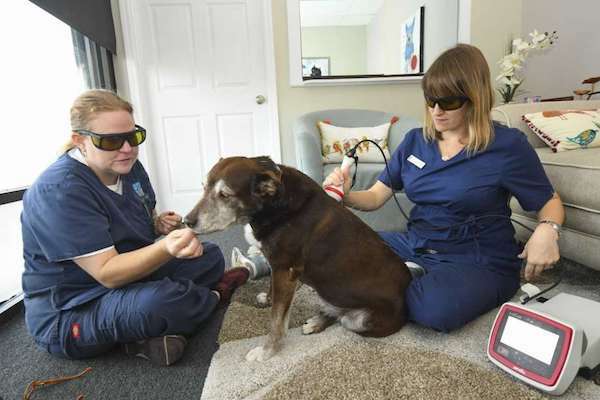 The 90-year-old was able to say why she didn’t want CPR or to be intubated if she became seriously ill.
Stacie Alves and Dr Julia Spade administer acupuncture and laser therapy to a dog with arthritis. Last Wishes has assisted more than 5,000 families with their petâs care since November 2012. Earlier this year, the organization opened the first compassionate comfort care center for pets in Houston. The center features comfort rooms that are used for hospice and pain management consultations, therapeutic laser, acupuncture, and compassionate sedation-euthanasia. People and their pets can build a strong bond together, and losing a pet can be difficult. When a pet becomes terminally ill, Last Wishes, Houston’s first pet hospice service, steps in to take care of a geriatric pet, from moment of diagnosis through death and aftercare. Dr. Christie Cornelius is the owner and veterinarian of Last Wishes. She also co-owns Earthman Last Wishes, Texas’ first water-based cremation service for pets. Cornelius and her associate, Dr. Julia Spade, will become the first two veterinarians in the state of Texas to become certified in Veterinary Hospice and palliative care in October. “I started imagining a better way to offer end of life services after a few years of general practice. I saw how difficult it was for pet owners to bring in their painful or otherwise ailing companions into an unfamiliar, sterile, noisy, scary environment for euthanasia,” Cornelius said. In 2012, Cornelius branched out and started Last Wishes while working full time at another veterinary clinic. Last Wishes has assisted more than 5,000 families with their pet’s care since November 2012. Earlier this year, the organization opened the first compassionate comfort care center for pets in Houston. The center features comfort rooms that are used for hospice and pain management consultations, therapeutic laser, acupuncture, and compassionate sedation-euthanasia. 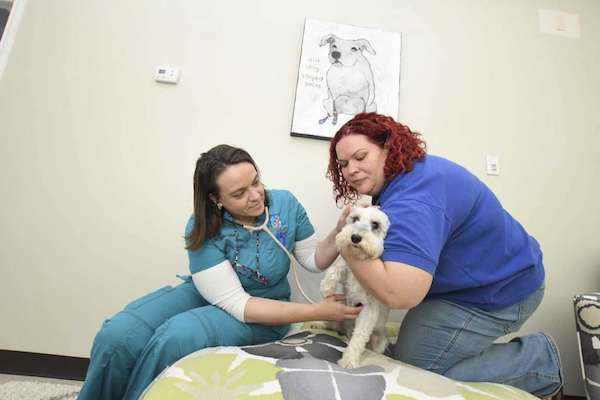 Cornelius’ goal is to help educate the community about pet hospice, comfort care, pain management, and gentle water-based aftercare services for pets. Dr Christie Cornelius and assistant Betty Rose Bryant perform an exam on a dog. Some of the common conditions the organization works with includes, but are not limited to, cancer, heart disease, liver disease, osteoarthritis, organ failure, cardiovascular and neurological disease, and vestibular disease. The majority of services are done in the comfort of the family’s home and in the pet’s environment. Services at the center include consultations, acupuncture, laser, sedation-euthanasia, pet loss support groups, and aftercare. Last Wishes also provides pet loss support groups and continuing education. Additionally, the organization assists disadvantaged families and individuals with their pet’s end of life care through the Last Wishes Fund, a non-profit organization funded by public donations. Last Wishes provides provide a folder of pet loss/grief information for each family, a clay paw print memorial keepsake, and gentle transport of the pet for aftercare services from the client’s home. Cornelius and grief counselor, Marilyn Ladin, are developing a pet loss support program. The program offers in-person and online individual and group therapy. This month Last Wishes plans to unveil of a public pet memorial gardens in Cypress. The garden will include four gardens and handmade stepping stones as a tribute to the pets the organization has helped. The memorial will also feature a special Rainbow Bridge. Families will have access to the garden on Sunday mornings as an opportunity to visit their pet in a peaceful and natural setting. 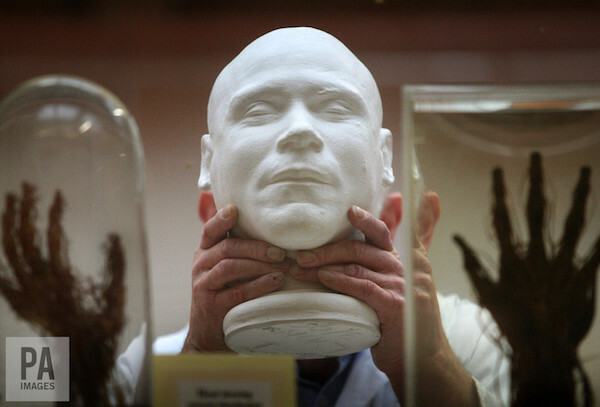 Making death masks of notorious criminals was common in the 19th century, such as this cast of murderer William Burke at the University of Edinburgh’s Anatomy Museum. [T]hese days many people know they are dying long before death finally arrives. Yet death, a natural event, is often seen as a failure of medicine. Despite the additional time modern healthcare may provide us, we still begin our conversations about the wishes of the dying and their families too late – or not at all. This reluctance to accept our own mortality does not serve us well. This taboo around death is a fairly modern, Western phenomenon. Past and present, societies have dealt with death and dying in diverse ways. It is clear from, for example, the outpouring of grief at Princess Diana’s death, and the conversations opening up around the 20th anniversary of the event, that these outlets are needed in our society too. High-profile celebrity deaths serve as sporadic catalysts for conversations that should be happening every day, in everyday lives. Recent bereavement theory has moved on from thinking of grief as a series of stages, to a continuous process in which the bereaved never fully return to some “pre-bereaved” status quo. It is increasingly recognised that the living form various sorts of continuing bonds with the dead, as put forward by the sociologist Tony Walter and psychologist Dennis Klass and colleagues – and this is certainly something that can be seen in death practices today across the globe, and among those practised in the past. In Neolithic Turkey, one funerary rite included the creation of plastered skulls – family members were buried under the floors of their house and after some time the skull was removed and a plaster face lovingly recreated over it. Many of these plastered skulls show evidence of wear and tear, breakage and repair, suggesting that they were used in everyday life, perhaps displayed and passed around among the living. Similarly, in modern-day Indonesia, the dead are kept in houses, fed and brought gifts for many years after death. While in this state they are considered to be ill or asleep – in this case their biological death does not entail social death. It was not so long ago in the UK that public outpouring of grief and practices that kept the dead close were acceptable. For example, in Victorian England, mourning clothes and jewellery were commonplace – Queen Victoria wore black for decades in mourning for Prince Albert – while keeping tokens such as locks of hair of a deceased loved one were popular. However, today death has been outsourced to professionals and, for the most part, dying happens in hospitals or hospices. But many doctors and nurses themselves feel uncomfortable with broaching the subject with relatives. Perhaps there are lessons to be drawn from the attitudes of others far removed from us in time and space: the past, and societies on the other side of the globe, are easier to discuss, yet act as prompts to help us discuss more personal experiences. The Continuing Bonds Project brings together healthcare practitioners and archaeologists at the University of Bradford and LOROS Hospice in Leicester to explore what we can learn from the past, using archaeology to challenge modern perceptions of and attitudes towards death and dying, and as a vehicle through which people can discuss their own mortality and end-of-life care. Hungary which has been on display since 1038. 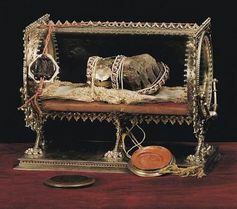 Though saints’ relics – generally body parts – have been a large part of Christian culture in the past and were not uncommon, they are something many are uncomfortable with today. One workshop participant describes the display of St Stephen’s hand as “selfish”, as if he is being exploited beyond the grave. What responsibilities do we have towards the dead? What constitutes “respect” for them? Archaeology shows us that it is a fluid and culturally embedded concept which differs wildly between societies and individuals. Memorialisation, through photographs or statues (that served the same purpose in the past), appears to be fundamental to “respectful” treatment of the dead. Death masks – plaster castings of a dead person’s face – and later even photos of the recently departed, were not uncommon as a way to memorialise the dead, even into the 20th century. Yet while taking photographs of the departed in life are celebrated, photographs of dead bodies themselves are less palatable today. 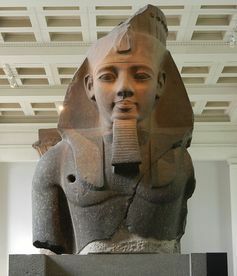 The vast stone bust of Ramses II in the British Museum. resides at the British Museum, while the feet remain in situ at the Ramesseum in Luxor, Egypt. Given that this individual lived in Egypt nearly 3,000 years ago, the statue has kept his memory alive. Yet its fragmented and dispersed nature prompted our participants to wonder how long their loved ones’ memories of them would persist after their death, and what legacies they would want to leave. Memorialisation of the dead takes a very different form at the 16th-century Capela dos Ossos in Évora, Portugal, where monks desiring to save the souls of some 5,000 people from overcrowded local cemeteries used their remains to create a chapel of bones. Individual bones were used to create decorative features such as arches and vaulted ceilings. Workshop participants were unhappy that bones had been removed from their resting place without the permission of the deceased. But for how long can our wishes be accommodated after death? The other feature that unsettled them was the dismantling of the skeletons – in the West today, our identity sits firmly with us as individuals, bounded by our physical bodies. Fragmenting our skeletal remains strikes firmly at this sense of identity – and so our sense of social presence. Such scattered remains are nameless, faceless – lacking the very thing that memorials seek to preserve. In other cultures – and in the past – identity is less individualistic and resonates within larger kin or community groups. Here, distributing bones may be less problematic and a part of the process whereby the recently deceased joins the host of communal ancestors. Though some of the topics were difficult to discuss, many workshop participants felt they had improved confidence in talking about death, dying and bereavement as a result. The range of practices from the past reminds us of the diverse ways through which death can be negotiated and the extent to which practices that we take for granted today are in fact culturally embedded, relative and subject to change. Persistent Facebook profiles of dead friends and family to which loved ones post on each anniversary are an example of how traditions are changing. In a world where death has become increasingly outsourced and medicalised, the diverse ways we treated and remembered our dead in the past should highlight the choices available to us and prompt us to consider those now banned or taboo. 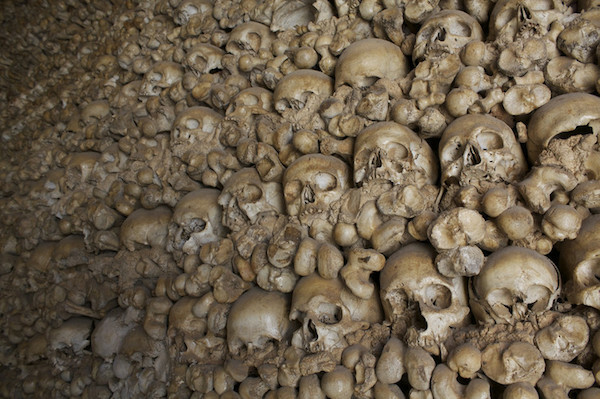 At the entrance of the Capela dos Ossos, the monks who built the chapel left an inscription, a momento mori that reminds us: “We bones that are here, for yours await”. The Bios Urn mixes cremains with soil and seedlings. 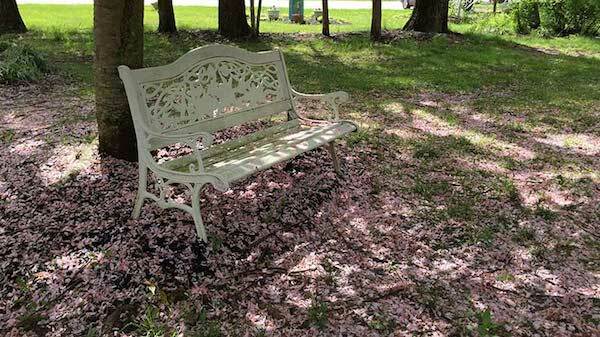 It automatically waters and cares for the memorial sapling, sending updates to a smartphone app. 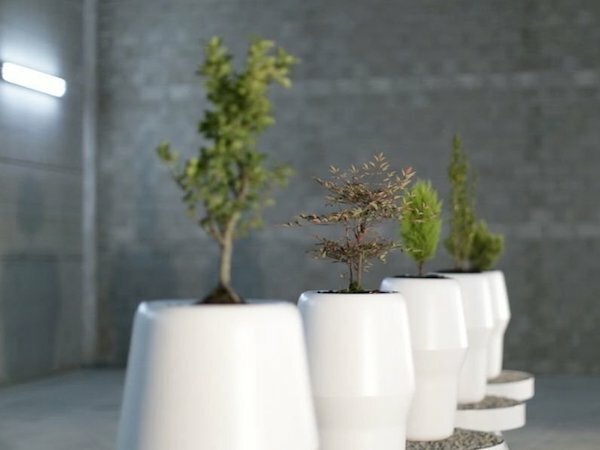 [E]arlier this summer, a modest little startup in Barcelona, Spain, unveiled its newest product — a biodegradable, Internet-connected funeral urn that turns the ashes of departed loved ones into an indoor tree. 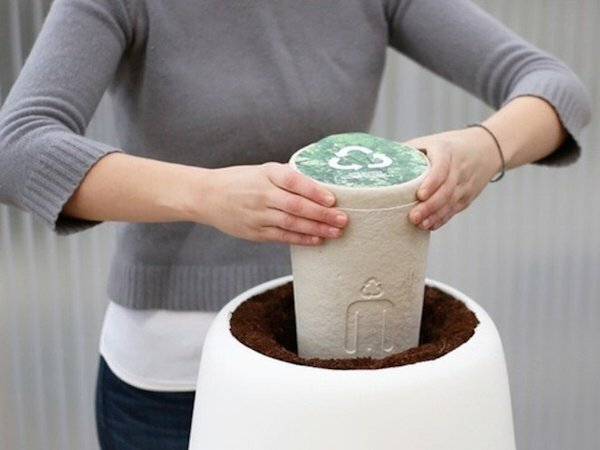 Just mix the cremains with soil and seedlings, and the digital-age urn will automatically water and care for your memorial sapling, sending constant updates to an app on your smartphone. The Bios Urn concept is indeed part of a larger transformation in which technology is changing how we think about death and dying, says Candi Cann, author of the book Virtual Afterlives: Grieving the Dead in the Twenty-first Century. [D]eath is something that we all, sooner or later, have to face. But how do we respond to it? Why are some of us more afraid than others? And what is it, exactly, that scares us about death? 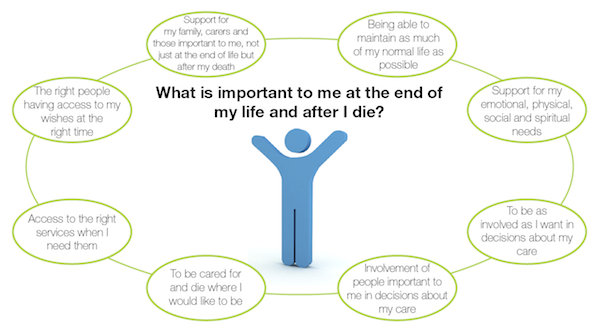 We offer an overview of theories related to death anxiety, and what you can do to address it. To a greater or lesser extent, it is likely that we are all scared of death – whether it be the thought of our own cessation or the fear that someone we love might pass away. The thought of death is not a pleasant one, and many of us avoid such morbid musings, naturally choosing to focus on what life has to offer, as well as on our own wishes and goals, instead. 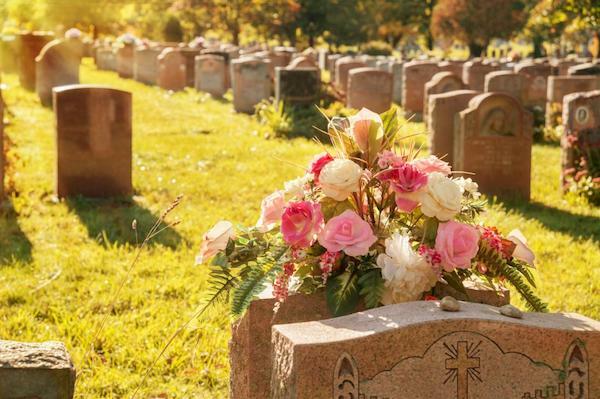 Yet, as Benjamin Franklin once famously wrote, “In this world nothing can be said to be certain, except death and taxes,” so it is no surprise that death-related worries sometimes take us by storm. Notably, thanatophobia – which is called “death anxiety” in a clinical context – is not listed as a disorder in its own right in the Diagnostic and Statistical Manual of Mental Disorders. Still, this rarely spoken-about anxiety has the potential to seriously affect people’s lifestyles and emotional health. That is why, he argued, everything everyone does – the goals we set, our passions and hobbies, and the activities we engage in – is, in essence, a coping strategy, and that these are things we focus on so we that need not worry about our eventual death. Becker’s work gave rise to “terror management theory” (TMT), which posits that humans must constantly deal with an internal conflict: the basic desire to live against the certainty of death. TMT emphasizes individuals’ self-consciousness and their drive to achieve personal goals, motivated by the awareness of mortality. Some newer approaches suggest a “middle way” between TMT and another theory referred to as “separation theory,” which highlights the importance of early trauma, reinforced by an awareness of mortality later in life. Another recent approach to understanding and explaining death anxiety is that of “post-traumatic growth theory” (PTG). 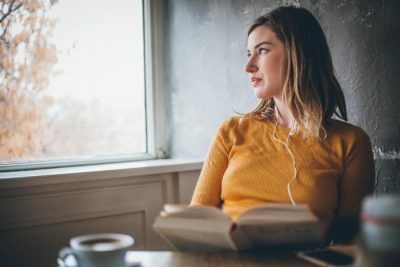 According to PTG, going through a distressing event – such as the death of a loved one or receiving a worrying health diagnosis – can actually have a positive effect, causing individuals to appreciate the small things in life a lot more, or to become more goal-oriented. One account of death anxiety – as reported by a man’s worried wife – emphasizes how this kind of fear can become obsessive and get out of control. There appears to be some correlation between a person’s educational and socioeconomic status and reduced death anxiety. To Treat or Not to Treat: What Would Your Loved Ones Want at the End of Life? 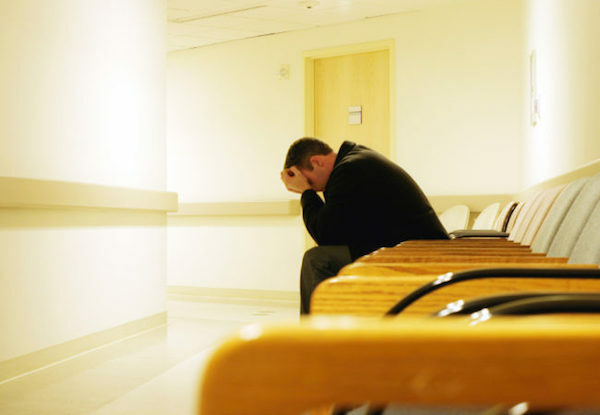 [W]hen someone you love is hospitalized with a grave illness or injury, you may face decisions about their care. Cardiopulmonary resuscitation (CPR), mechanical ventilation, tube feedings, surgery, chemotherapy or other interventions may add weeks, months or years to their life. [I]’ve been present with hundreds of people as they’ve died, hundreds more who were already dead by the time I was paged, and hundreds more who were in their dying process. I’ve accompanied spouses, parents, children, friends and family members as they’ve experienced the horror and sorrow of grief. For the past 20 years, I’ve been a chaplain, mostly in hospitals, a few with hospice. In doing this work, I’ve crossed death’s path more often than I can count as I’ve zigzagged my way through the hospital corridors and in the homes of folks experiencing the last days, weeks, months of life. Those of us on the interdisciplinary healthcare team struggle, as best we can, to provide our dying patients with a “good death,” however they and their families define such. There’s a saying in healthcare, “People die as they have lived.” Sometimes that is not the case, but, more often than not, that’s the way it goes. What does our Quaker faith and spirituality offer us as we face decline, diminishment, and death? What can we say, as Quakers, with regard to dying and death as a personal and spiritual experience? Is there a Quaker way of dying? How do we, as Quakers, do this? My formative experience with regard to the Quaker way of dying was by accompanying a Friend through her decline and death. Her final illness, dying process, and death were Quaker community and meeting experiences. Her experience wasn’t a private or family-only affair. When she couldn’t come to meeting, small groups of Friends were dispatched to her home, hospital, or nursing facility to have meeting for worship with her. Friends from meeting stayed with her overnight in the hospital when she had to be on the breathing machine and was so uncomfortable and scared. She had a committee of trusted Friends who arranged for her practical needs when she was still able to live independently, including staying with her 24/7 when just home from the hospital and at times of extreme debility. These Friends helped with discernment regarding transition from independent living to a skilled nursing facility. In what turned out to be her final hospitalization, these Friends helped her discern her choice to decline heroic life-sustaining treatment and allow herself a natural death. Friends reflected with her about her desire for integrity and living in alignment with the testimonies, her beliefs about an afterlife. She was afforded the opportunity, though her Quaker way of living, to proceed to a Quaker way of dying. One First Day, as we knew death was approaching, our meeting of about 80 Friends decided to meet in a hospital conference room for worship. About halfway into the worship hour, a Friend came downstairs to announce our Friend’s death. It was a gathered meeting. Our Friend died the way she had lived. Last year, desiring conversation on these questions, I facilitated an interest group I called “The Quaker Art of Dying” at the Pacific Northwest Quaker Women’s Theology Conference. The conference brings women together from the divergent Friends traditions in the Pacific Northwest, primarily from Canadian, North Pacific, and Northwest Yearly Meetings, as well as other independent meetings and churches, to articulate our faith and to learn from each other. The group was well attended and diverse. I presented three queries to the group for discussion. We broke into small groups each taking one of the queries, then reconvened into the large group to get the bigger picture. What is a Quaker approach to declining health, dying, and death? How do our beliefs, testimonies, and values inform our approach to the end of life? [F]riends agreed in their understandings that we have a direct connection with the Divine. Some Friends voiced a lack of fear about death. Others voiced fears about the decline of physical and cognitive abilities and the actual process of dying, such as the possibility of pain, loss of competence, being a curmudgeon, or depleting family resources. One Friend likened the burdens of dying to birthing: “Both are hard work.” Friends agreed that upholding the dying person in community benefits the community as well as dying person. Friends voiced an intention to allow support and presence of others as we approach the end of life, as well as taking all the alone time we need. How can we prepare for death? Our own and that of our loved ones? A list emerged. Think about what we want. Talk about what we want, even though it is difficult, especially with our children. Talk about what others want. Talk with our families about our wishes. Deal with unfinished business—either finishing it or leaving it unfinished, but dealing with it intentionally. Educate ourselves about health decline and the dying process by reading books like Atul Gawande’s Being Mortal. Talk with our spouses or significant others, about things we’ll need to know if they can’t tell us themselves for whatever reason. Who do we want involved? Who do we not want involved? Do we want a care committee or not? How do we want our remains disposed? 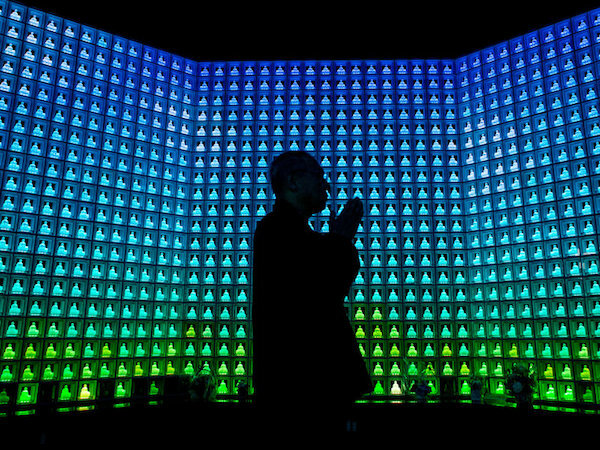 Do we prefer cremation or burial? If we want to be cremated, do we want our remains to be scattered, interred, or buried? What do we want for a memorial or funeral? Do we want an obituary; a eulogy? What would we want said in our memorial minute? We need to help meetings and churches be prepared for the decline, debility and deaths of their members and attenders. This conversation continues. In a recent meeting of our Quaker women’s discussion group, I facilitated a robust discussion about a Quaker approach to end-of-life issues and posed similar queries to the group. Evangelical Friends spoke of the “continuum of life” that transcends death, the need for “being right with God,” and the peace that “being with Jesus” will bring. Liberal Friends spoke of “entering the mystery” and “going into the Light.” There seemed to be agreement and assurance that “all will be well” at the end of physical life. Some women focused on the need to enter this time of life with their “affairs in order.” Other women spoke of their experiences accompanying a dying person in their meeting or church or in their own families. All seemed to enjoy the discussion of “things we don’t usually get to talk about” and voiced an intention to encourage further discussion in our churches and meetings. Later this month, I will attend my own meeting’s retreat where the topic will be “Spirituality As We Age.” No doubt, we will be continuing the discussion of how we Quakers intend to die as we have lived.